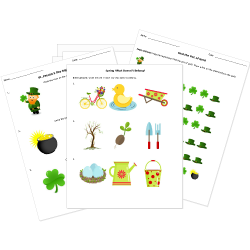 Connect learning to the seasons and holidays with our large collection of seasonal worksheets. Seasonal math worksheets incorporate special images and scenarios to provide students with timely activities and holiday problems. Don't see a printable you need? Use our Test Maker™ to create your own printable that fits your needs. Browse questions or use our advanced search to find existing questions while filtering by grade levels and keywords. You can also create your own questions. Recognize Earth Day on April 22 with this collection of science, math, writing, and reading passage worksheets. Read 10 Engaging Earth Day Activities for Kids to find more fun ways to celebrate Earth Day with your students! What Can Go in the Compost?